WHERE CAN i BUY DU JOUR? Our Slimming Support tights encourage circulation relieving leg fatigue – ideal for air travel or any profession where you are on your legs most of the day. Extra upper support slenderizes tummy and hips too! 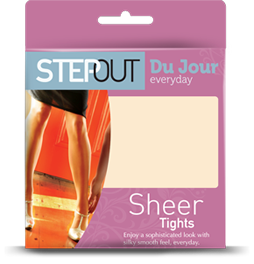 'Slimming Support sheers' are oh so silky and the 'Slimming Support Opaques' are velvet thick and toasty. Try our 80denier trouser socks (available in ribbed and smooth knit) and variety of ankle, foot and knee products. Our huge variety of gorgeous contemporary hosiery will ensure you have just the right product and style for every occasion.